I’m grateful to share Brandon Fredenburg’s contribution to our Summer Blog Tour. Brandon is a thoughtful writer who shares resources and perspectives that I usually overlook. I’m afraid the title is more ambitious than my few paragraphs offer. To make my task more manageable, I offer a few idea-starters about the gospel as taught by Jesus, Paul, and the early church bishop, Athanasius. to proclaim the year of the Lord’s favor (my translation). When Jesus omits “and the day of our God’s vengeance” (Isa 61:2b) and rehearses God’s blessing of a foreign widow and an enemy general, he turns the gospel of God his hearers expect inside out. “He isn’t just our God and he blesses our enemies,” Jesus reveals. Their reaction, like their “God,” is one of deadly vengeance. Perhaps this is why Jesus begins his evangelizing with the word “repent.” Apparently, even John the Baptist missed it, as Matthew 11:1–15 makes clear. Jesus says those who even barely grasp his message have far greater insight than John. John’s gospel of violent, fiery judgment, it seems, put him at odds with Jesus’s view of the nature of the kingdom of the heavens. “Repent,” then, as Jesus uses it, retains its core meaning of “shift your paradigm” with reference to God and God’s kingdom. For John, repentance focused on the personal sacrifices required for holiness; for Jesus, repentance kept its eyes on the merciful nature of God toward all persons (Exod. 34:5–7; Jonah 4:2b). “For I delight in mercy but not sacrifice; and in knowledge of God rather than burnt offerings” (Hos. 6:6, my translation). Jesus’s gospel is about his Father and his Father’s nature. The Father’s nature was so misunderstood, Jesus claims no one but he knows the Father (Matt. 11:27). He then immediately invites those wearied and burdened by compromised gospels of God to come to him for rest, to take on the easy, restful yoke of learning as a disciple of his gentle humility and light burden. “No one knows the Father except the Son”: not John the Baptist, not the Pharisees or the scribes, not Moses or Elijah, not Jesus’s disciples, no one except he … and his post-resurrection disciples. The Father is known rightly and fully only through his Son (Heb. 1:1–3b). Jesus’s gospel reframed a self-serving view of his Father’s compassion; Paul’s gospel applied Jesus’s message more widely. Two passages are especially rich: 2 Cor. 5:11–21 and Eph. 2:1–10. In 2 Cor. 5:14, Paul claims that Christ’s death universally incorporates humanity. In his death, all died. When this insight becomes clear, a whole new world comes into focus. Paul knows this from his own experience: before he embraced it, he viewed Jesus as a renegade false prophet whose death was just. Once the scales fell from Saul’s eyes, he saw the new creation. He no longer saw through Adam’s blind, fearful, ashamed, sin-focused eyes. Jesus Messiah incarnated into the old, blinded, fearful, ashamed, sin-wracked Adamic humanity, embraced it and us fully and carried it and us into Death. And by God’s own unilateral act of cosmic justice, Jesus (and it and us) were raised to newness. Paul makes a parallel point in Ephesians 2, but goes farther. In 2:1–3, Paul sets the cosmic stage: we were all dead in our sins, naturally characterized by impulsive anger, like the rest of humanity. The “we” in 2:1–3 is undoubtedly all Adamic humanity. “But,” Paul contrasts, “God, being rich in mercy, because of his abundant love with which he loved us — even while we were dead in our sins — co-enlivened us with Christ: you are rescued by [God’s] favor!” Not only did we all die with Christ, God raised us all up and seated us all with Christ. This rescue from Death is anchored in God’s favor, accomplished by God’s faithfulness, given as unconditional gift, and integral to God’s (new) creation-act. Paul extends Jesus’s gospel to include Jesus’s cooperation with the Father in rescuing Adamic humanity from its errant view of God and the self-caused alienation “in our own minds” (Col 1:21). The rescue for all humanity has been a fait accompli since Jesus’s resurrection. The message of what God has done in Christ is proclaimed so that, by awakening to its truth, all persons can dwell in the present blessings of the new creation. Just as Paul authoritatively interpreted Jesus’s gospel in scripture, Athanasius’s views both reflected and influenced the understanding of the early church (ca. 200–400). In contrast, Augustine’s perspectives (post-400) dominated the Latin church and, through it, the Reformers and most of contemporary Evangelicalism. In his On the Incarnation of the Word, Athanasius explains that humanity, brought to life out of nothing, maintained life by keeping a clear knowledge of God’s nature (i.e., the Logos) within them. Humanity’s existence depended on an uncompromised trust and dependence on God. Once the devil deceived humanity into mistrust, humanity cut itself off from its source of life and knowledge. Thus, by degrees, humanity not only lost its ability for clear reason, it began to disintegrate into physical death and, beyond that, into the corruption of utter nothingness; that is, into Death. Return to nothingness was not a God-imposed punishment, but a God-warned natural consequence of cutting our own umbilical cord. It was both intolerable to and unworthy of God that he would do nothing to rescue those created in his own likeness, especially because they had been tricked by falsehood, and because a neglect to rescue them would demonstrate weakness. Thus, a rescue by the Logos that had created humanity was needed. The incarnated Logos fully incorporated all humanity into his own body, joining corruptible to incorruptible, and sacrificed himself (and us in him) to death to settle Death’s claim. Since Christ is the incorruptible Logos, Death could not contain him. By Christ’s death, Death died. Because we died his death and he ours, physical death is no punishment and Death-as-annihilation is no possibility. Moreover, once Death died, Christ then offered himself (and us in him) to the Father, who raised him as firstfruits and will raise us-in-him at the final resurrection. The gospel of God is not an invitation. It has no steps for us to climb to seek and gain God’s favor. It is not an offer that, by accepting, we activate its benefits. No, the gospel is far greater. The gospel is the astounding declaration that, despite having gotten God all wrong in our thinking, having mischaracterized, misrepresented, maligned, mistreated, and had malice toward him, God has never been against us. To be sure, God has been against all our fearful, ignorant, misguided, vengeful characterizations of him and their effects, but he has endured them to be with us so that we might truly glimpse him and repent. He did not leave the glimpses to chance, but manifested himself entirely in the Lord Jesus Christ and the new creation life in which we participate. The basis of the gospel has always been God’s compassionate nature toward all creation; its benefits have always been active for all persons, but its enjoyment is possible only to those whose eyes see. Repent, and believe the gospel of God! Peace and all good to all, always. Brandon L. Fredenburg is a professor of Biblical Studies and assistant dean for the College of Biblical Studies and Behavioral Sciences at Lubbock Christian University. He lives, ministers, and teaches in Lubbock, Texas. I’m not sure that I’ve ever heard “Simplicity” named as a value within Churches of Christ, yet it exudes from each and every historical pore. Perhaps the value is best represented in our pioneers’ pursuit of “common sense” theology & philosophy. Consider the numerous ways the Restoration Movement has sought to distinguish itself from other churches. We rejected human creeds as extra-biblical with with simple slogans such as “No creed but Jesus”, and “Bible names for Bible things”. We taught against denominational structures in favour of self-autonomous congregations (not a Bible term). The Restoration Movement has always emphasised the priesthood of all believers, and the ability of each individual to interpret Scripture for him/herself. This contrasts with denominations who have an ordination process for their clergy, dress them in robes, an d call them by a title. The leadership of local congregations rests with elders and deacons appointed according to the Biblical criteria of Titus 1 and 1 Timothy 3. There is no elected board or constitution to negotiate. Churches of Christ have seldom attempted to build cathedrals. Most church buildings have emphasised simplicity and rejected stained glass, paintings and ornaments as distractions and potentially idols. All of these customs reveal an underlying value of simplicity, whether this term is ever used or not. The Restoration Movement was all about Simple Church even before the book was written. In my experience the church has rarely made the same application to Christians’ personal lives. Many preachers and church members have undoubtedly sacrificed a lot to spread the kingdom of God, but I don’t know that this has been widely preached as an expectation of the church. Both Harding and Lipscomb lived this way as a result of their conviction that God calls all Christians to live as pilgrims, or resident aliens in the world trusting in the providence of God. In The Cruciform Church (p169), C. Leonard Allen calls attention to 1 John 2:15-17. Jesus kingdom is not of this world. (Jn 18:36) We live in a society of gadgets. The advertising industry constantly entices us with the next hot thing: the thing that will truly make our lives simpler. Often we buy into the deception that more stuff will create more space. It doesn’t work. Removing stuff remains the only way to create space. When Jesus needed time with God he removed himself from his village, from his friends, from the crowds, and found the quiet space of a hillside. I don’t want to use this post to suggest that Christians should sell everything and live under a bridge. I don’t want everyone to turn Amish. I don’t want to give the impression that God is simple, He’s not. I do want to call all Christians back to the fact that our faith and our lives orbit around God. He’s our centre. In a busy and materialistic world we need to create space to spend time with God. To listen to God. To talk with God. What have traditionally been called “spiritual disciplines” need to regain prominence in the lives of the church. It’s not enough to have simple church buildings. We need a simple faith, and a simple relationship, that allows us to tackle the complexities of life. Hopefully, in the next couple of days I’ll put up a couple of posts on Spiritual Disciplines. Have you been part of a church that actively encourages members to practice spiritual disciplines? How did they do this? How important are personal spiritual disciplines in your life? Churches often promote prayer and Bible reading as standard disciplines. Are you content with the basics or is it important in your relationship with God to be creative? Does your relationship with God benefit more by practicing a variety of disciplines or a variety of approaches to the basics such as prayer and Bible reading? This week I’m posting daily discussion of points I raised in my July 8 sermon on the topic of worship. The sermon highlighted four pairs of values that often seem in tension with each other. Here is the second pair. Historically, Catholicism stressed the role of the church as a conduit to saving relationship with God. Even though they valued personal piety and even monasticism and solitude, they still administered these personal disciplines under the auspices of the church. One of the major offenses leading to the brutal persecution of Anabaptists in the during the Reformation by all major denominations of the time, was their teaching that individuals needed to decide for themselves whether they wanted to follow Christ. Anabaptists believed that the church could not save someone who didn’t want to be saved. Popular thought at the time held that you were a Christian courtesy of whichever church had baptised you, usually as an infant. The pioneers of the Restoration Movement similarly held that the churches of their day had assumed too much power in determining individual’s salvation. Alexander Campbell’s personal experience involved being interviewed by elders at a church to determine his worthiness to participate in their semi-annual Lord’s Supper. As Campbell and other restoration preachers traveled the western frontier they gave people the opportunity to make their own decision to follow Christ. By fulfilling the five steps of salvation laid out in Scripture individuals could gain confidence in their salvation without it needing to be ratified by the church. Modern evanglicalism took this a step further in their emphasis on Jesus as a “personal Saviour”. Perhaps as an inevitable consequence, many people today seem to hold the position that they don’t have to worship with the church to be a Christian. Often they present this in a way that sounds spiritual and pious, but there’s no doubt that God intended the church to come together to worship Him. All the letters in the New Testament were written to or about churches: groups of Christians. Some passages give considerable detail about how the church should conduct itself when it comes together. For example, 1 Cor. 14 describes a gathering of the NT church, as does 1 Cor 11. Additionally, the numerous “one another” instructions scattered throughout the New Testament writings can only be practiced in a congregational context. I can think of numerous worship songs that we sing connecting our time of worship with the presence of God. Ironically, as I got up to preach this sermon, we sang “May My Steps be Worship”. Only in this particular version an over zealous editor had changed the line to read “May My Steps Lead to Worship”. It was the perfect (if tragic) example of the topic at hand! Individuals do need a personal relationship with God. Jesus died for each of our sins individually. 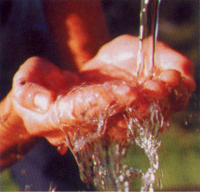 At Pentecost (Acts 2), the apostle Peter did not respond to the corporate question “What must we do [to receive forgiveness]?” by symbolically baptising the crowed with a bottle of water. Each person individually had their sins removed in baptism (“Those who accepted his message were baptised, … about three thousand…”) and individually received the gift of the Holy Spirit in their lives. But individuals also need a church. In 1 Corinthians 12:15 we find the illustration that a part of the body (foot or ear) decides to separate itself, it can’t. Christians, by nature, form an interconnected body and our attempts to isolate ourselves run counter to God’s design. Verse 26 demonstrates this perfect design, “If one part suffers, every part suffers with it; if one part is honored, every part rejoices with it.” An additional benefit of body life is described in Hebrews 3:13 “encourage one another daily, as long as it is called ‘Today,’ so that none of you may be hardened by sin’s deceitfulness.” Our eternal salvation benefits from the involvement of other Christians in our lives. It saddens me that the term “worship wars” has been used over the years to describe the conflict (often inter-generational) between traditional and contemporary music styles in worship. I’m eagerly waiting for the day when we have “worship wars” over whether we’re doing enough to worship Monday to Saturday. Also relevant is They Like Jesus But Not the Church by Dan Kimball (Zondervan: 2007) which encourages the church to leave its ivory tower and live the way we teach. How do you make your daily life an “act of worship”? What does that mean to you? Do you regard Sunday worship more as a culmination of your past week of worship, or necessary to prepare you for the coming week? I’m transitioning my Family Reunion sermon series from discussing our genealogy to looking at some areas of faith and church life that the Restoration Movement has rightly emphasised. These areas do not necessarily make us unique, but they are still important to who we are. If your family traveled to Disney World every 5 years, you could never say that visiting Disney made your family unique, but the regularity of your trips and the uniquely shared memories would make those trips an important element in your family’s identity. 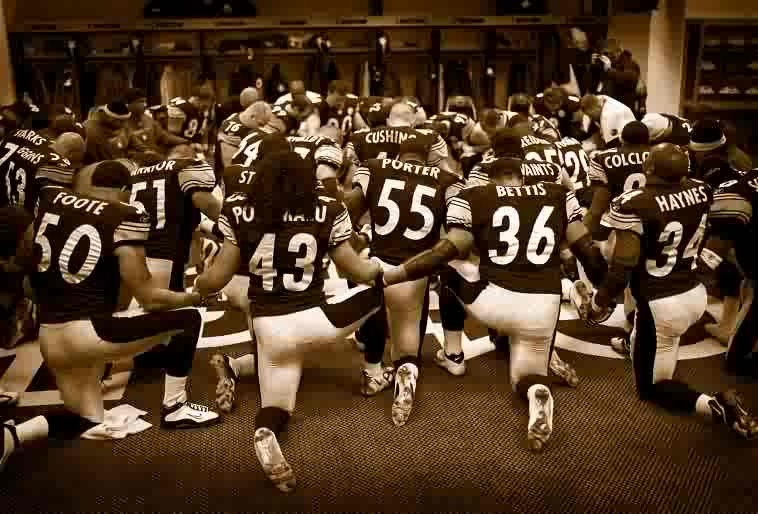 In a similar way all churches gather together to collectively worship God. However, the Church of Christ has our own set of customs and emphases around this event that shape our identity. I believe that deeply engrained in the subconscious of Churches of Christ is the conviction that “our corporate worship must please God“. In a sense, our acapella singing reflects this conviction. We might personally prefer singing with instrumental accompaniment (and lets be honest, that’s what 99.8% of us listen to on our radios and ipods), but we sacrifice our preferences to worship God in a manner which he apparently prefers. Since my roots run on the instrumental side of the Restoration Movement but I now minister in an acapella church, I think I have a pretty good grasp of both sides of that discussion. That’s not where I want to go today. I believe that Churches of Christ for 200 years have done a good job of reminding the world that our worship must be God-focused. This is particularly important in a broader environment where “attractional” models of worship-evangelism continually push the envelope toward mere entertainment. One of the big topics in any Bible study about worship revolves around the topic of whether worship only happens in designated acts and at designated times (eg. 10am Sunday, or prayer at my desk) or whether worship engages the entire spectrum of our life activities. (I recently heard a presentation that suggested that Christian coaches should encourage their players to view their athletic events as worship.) I believe the answer is Yes. We should live our entire lives in a way that brings glory and honour to God. On the other hand, we can’t really equate playing football to singing praise to God with room full of other Christians, or to the broken hearted prayer of a repentant sinner sitting in their car. Worship is one’s heart expression of love, adoration, and praise to God with the attitude and acknowledgement of his supremacy and Lordship. Worship is an act by a redeemed person (the creature), toward God (the Creator), whereby his will, intellect and emotions gratefully respond in reverence, honor, and devotion to the revelation of God’s person expressed in the redemptive work of Jesus Christ, as the Holy Spirit illuminates God’s written word to his heart. Worship means “to feel in the heart,” and to express in some appropriate manner what we feel. True worship and praise are “awesome wonder and overpowering love” in the presence of our God. The heart of true worship is the ability to magnify God with our whole being – body, soul, and spirit. Worship is fundamentally God’s Spirit within us contacting the Spirit in the Godhead. Worship is the humbling of self and the exalting of God. Worship is the act and attitude of wholeheartedly giving ourselves to God, spirit, soul and body. Worship is simply the expression of our love for God, which Jesus said, should involve all our heart, mind, and physical strength. (Gerrit Gustafson in Psalmist (Feb-March, 1991), 31. I know that’s a long list! How do you define worship? Do you agree with one of the above, or does the final conclusion more closely reflect your approach? Notice that all these definitions focus upon our relationship with God. In your experience, do most churches focus upon the HOW or the WHY of worship? How can churches do a better job of communicating the WHY of worship? One of the exciting aspects of the Restoration Movement is the name “Restoration”. While it has previously had a fairly narrow focus on “restoring the New Testament church”, we have an opportunity to expand that application. In many ways the whole of Scripture describes a movement toward restoration. In Acts 3:21 the apostle, Peter, described the return of Jesus as “the time … for God to restore everything , as he promised long ago through his holy prophets.” History culminates, not in destruction, but in restoration! If the church exists as an outpost of God’s kingdom, then we must adopt His mission as our mission. As God works toward restoration, then we must also. But what does this look like? I believe it means that the church and its members will involve ourselves in social and humanitarian causes that work to restore justice and equality in our society. When we see decay and brokenness we recognise the need for God’s restorative healing to work. This need may exist in a marriage, or in a neigbourhood, or a nation. The grand scheme of restoration involves eliminating hunger, disease, war, environmental pollution, discrimination, etc. While we live in a world impacted by sin we can’t eliminate all of these, but we can make a difference for God. To see an example of a church that has committed itself to the expanded theme of restoration visit the website www.ARestorationMovement.com. The Highland Church of Christ in Abilene, TX has committed itself to restoration projects within the church, the local community and around the world. You can listen to the sermon that launched this project here. Of course, restoration of a spiritual relationship between God and humanity through the death and resurrection of Jesus remains the primary mission of the church. But proclamation of the Gospel still fits within a greater context of the restoration of Creation which we cannot ignore. What’s your first thought at the idea of linking faith with environmental stewardship? What comes to your mind when you think of Christ returning to “restore all things”? Can you think of examples from the New Testament that demonstrate an enlarged Restoration Movement? Read 2 Timothy 2:22-26 here. Last week I criticised the application of the Restoration Plea to restore the New Testament church. I believe that too much emphasis has been placed on restoring New Testament structures, leadership models, and worship habits. The Restoration Movement, and Churches of Christ in particular, has generally come to define itself by these issues. My greatest concern is that none of the New Testament authors thought it necessary to discuss these issues in detail. (Paul’s treatment of the Lord’s Supper in 1 Corinthians 11 proves an exception, but still doesn’t address questions of which day, or how often to participate in the Supper.) The obvious reason for this omission is that the New Testament letters are occasional in nature and address specific issues that particular congregations or individuals faced. We learn from these teachings and apply all we learn to our lives and churches, but we’ll never have every single question answered unequivocally. Still, if specifying an exact 24 hr period in which to worship was crucial to our relationship with God, it’s hard to imagine that there was never any tension between Jews and Gentiles regarding this issue. After all, the Jewish day begins at sunset, and the Roman day begins at midnight. So the Jews could worship and take the Lord’s Supper on Saturday night and still be “meeting on the first day of the week”, while the Gentiles would have to wait until midnight. Then the Gentiles could worship Sunday night when the Jews couldn’t. Surely it would have been necessary to clarify this “important” issue in one of the letters to ensure that “true” worship was offered to God! (I might have just chased a hare with that last paragraph.) The primary point of this post and the previous one is that we have misplaced our priorities. Here’s my suggestion for how to “restore” our priorities. We need to restore an emphasis on the explicit Biblical teachings. There are many places to begin this restoration process, such as the Sermon on the Mount. My suggestion is to review numerous lists of virtues scattered throughout the New Testament. The problem is I don’t think all of these ever disappeared, but I do think all Christians need to be reminded of them regularly. 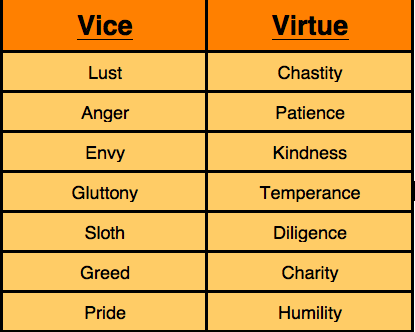 Often the “Lists of Virtues” are juxtaposed with “Lists of Vices”. For instance, The Fruit of the Spirit in Galatians 5:22-23 immediately follow the Fruit of the Flesh in verses 19-21. It seems Christianity in general has done a much better job of communicating the “Lists of Vices” than the more positive “Lists of Virtues”. Churches effectively communicate the evils of say… abortion and homosexuality, but apparently struggle to help people grow more patient or gentle. They also have not proved very effective at actually reducing participation in the “vices”. It’s no wonder outsiders regard us as hypocrites when we don’t practice what we preach. Can you imagine how our churches would be different today if 200 years ago our most influential preacher, teachers, and writers had emphasised the need for self-control, or taught us how to think on whatever is noble, and lovely. If we had 200 years of teaching on how to add goodness to faith (2 Peter 1:5) without becoming self-righteous and while maintaining humility, how might our movement be different today? I’m convinced that that when the New Testament church is restored, or created, it will be known as the church that loves the most. It will be the church that practices the most patient. It will be the church that forgives the most readily. It will be the church that most demonstrates humility. And it will demonstrate these virtues not through its perfection, but because it embraces people who need love, who stretch patience, who regularly offend and require forgiveness. It will NOT be known as the church with the most correct worship service or leadership structure. I wrote a lot more than I intended when I started this post. Now it’s your turn, any comments? How can churches practically help Christians practice Godly virtues? Apparently just preaching about it isn’t enough. Do you agree that churches generally preach about vices more than virtues? What defines a “New Testament church” in your mind? No denominations in the Bible – so they must all be wrong. The priesthood of all believers (2 Peter 2:5) means clergy is wrong. Elders and deacons are the only biblical church leaders – any other hierarchy is wrong. The Bible always refers to a plurality of elders/deacons – so it’s wrong to have just one. The NT church met on Sunday – any other day is wrong. They believed the Lord’s Supper must be celebrated each Sunday – any other schedule is wrong. No creed but the Bible! When the pioneers of the Restoration Movement established a congregation that looked like this, they believed they had restored the New Testament church. However, it’s doubtful that a single congregation ever implemented all the New Testament teaching. I believe many churches may have had the qualities listed above, but the majority of the epistles were written to correct the New Testament churches. When the New Testament teaches on how the church should be structured and how it should behave God speaks in a theoretical way. The New Testament epistles don’t really describe an existing church, they encourage the existing church to attain a higher degree of maturity. So can we restore something that never existed? Stone and Campbell used the word “restore” because they were convinced that existing churches had moved so far from the teaching of the New Testament. Perhaps they more accurately “sought to radically implement the New Testament teachings in a new church movement”. They would have rejected this proposal as they didn’t want to start another denomination, but I think it’s a closer description their teachings. Further, most items on the above list come from “logical conclusion” rather than explicit New Testament teaching. Surely restoring the New Testament church would mean focusing on the explicit teachings of Scripture, not on extrapolations and necessary inferences. For example, does the fact that the church described in the New Testament met on Sunday really forbid meeting on any other day? That’s a logical conclusion. On the other hand, James 4:12 explicitly establishes God as the only judge and asks, “But you – who are you to judge your neighbor?” However, that hasn’t prevented churches of Christ frequently disfellowshipping other churches and freely “writing up” individuals and pointing the finger at entire denominations. When logical conclusions relegate explicit teaching to second place the New Testament has NOT been restored. Can you suggest some other CoC “distinctives” related to structure and worship to add to my list? Is it important to you for a church to be a New Testament church? 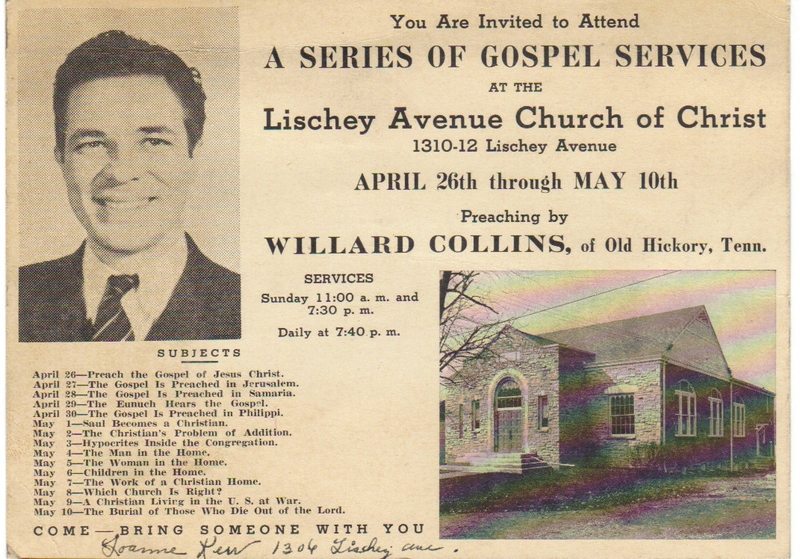 Do you think all churches today are New Testament churches? What identifies a New Testament church in your mind? I’m not preaching this week, so I’m able to use my time to prepare for my next sermon series. Our church has decided to make June “Family Reunion Month” (perhaps becoming an annual event) as we revisit some of our basic beliefs and practices. Discussing the virtue of the goal of “Restoring the NT church”. Re-visioning and expanding the goals of the Restoration Movement along the lines of the Highland Church of Christ in Abilene, TX. Examining some of our peculiar practices that we draw identity from and explaining them to newcomers. For example: Our high view of Scripture and our emphasis on making worship about God. The value of weekly Lord’s Supper is another positive practice. What are the positive themes and practices that you can identify among Churches of Christ? Read the related posts here. We find one of the traditional “Steps of Salvation” that people often overlook in Matthew 10:22 “You will be hated by all for my name’s sake. But the one who endures to the end will be saved.” This is a much more important message than the often quoted first step of “Hear”. Why tell someone who’s already listening to you that they need to “hear”? On the other hand, we must encourage new Christians to understand that they’re making a long-term commitment. 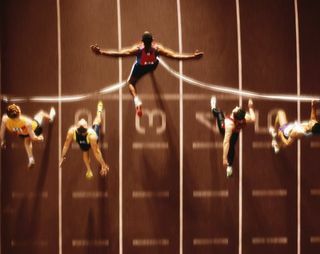 James 1:4 “Let perseverance finish its work so that you may be mature and complete, not lacking anything. Love – 1 Cor. 13:7 says “Love always perseveres.” Love will help us endure where obedience would just give up. Love is the stronger motivation. When our relationship with God is based on love, we’re more likely to survive the difficult times. Prayer – Calling on God in times of trouble invites God to actively help us through those times. In 2 Cor 12:9 Paul quotes God saying “My grace is sufficient for you, for my power is made perfect in weakness.” The times we’re most aware of our shortcomings are the times we create the most space in our lives for God to demonstrate his power. We depend on him, rather than ourselves. Scripture – The psalmist described God’s words as “a lamp to my feet and a lamp to my path“. God’s word guides us through life with its teaching, advice and examples. The Bible also motivates and inspires us by reminding us of our goal: our God. 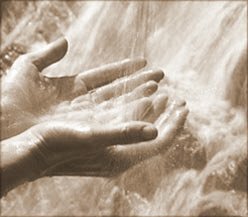 The Holy Spirit – Most importantly, when we immerse ourselves into Christ, we “enter God” and simultaneously “God enters us.” According to Acts 2:38 We receive the “Gift of the Holy Spirit”. It’s this very same Spirit that Jesus describes as a Comforter, or Encourager, or Counselor in John 14:16. It’s the Holy Spirit’s role to comfort, encourage, and counsel when our faith is on the rocks. When life is tough God will still be with us, helping us to endure. We don’t have to endure alone. Why do you think this “Step” seldom makes the list? How do you cultivate your faith to give it endurance?